What Are The Best Bird Watching Magazines Subscriptions? 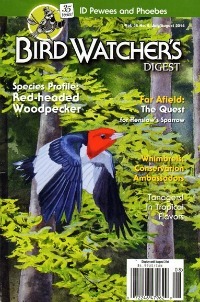 Quaility bird watching magazines subscriptions are available for every level of birding interest one might have. Most have full color photographs and informative articles about feeding, planting, and houses for wild birds. The only problem is trying to narrow down the list. While these are not by any means the only ones available or recommended, they are the three I feel good recommending. They are both affordable and informative, making them great gifts for yourself or a friend. A brief description and subscription information is provided below. Clicking on the link will take you to the magazine subscription information. Use your back button to return to this page. Currently on my list as a must have for most birdwatchers. A bi-monthly magazine filled with information on how to attract birds, making positive ID's with the help of beautiful photographs by expert photographers. Learn how to make your backyard the place where birds feed and nest. You'll find information on the best places for birdwatching in North America, and so much more. This full color bi-monthly magazine (6 issues per year) is for backyard birders and gardeners. Birds and Blooms combines Americas two favorite pastimes. While not an indepth scientific journal, Birds and Blooms appeals to the everyday backyard birder. You'll find beautiful photos and general information on backyard birds and gardens. 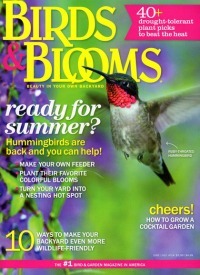 Each issue offers answers to readers questions on birds and plants. Readers send pictures of unusual bird houses and feeders. You'll also find limited advertising which can be a plus. One of the nicest features is the "Time For A Walk" pictorial. A great gift for any bird watcher or flower gardener. Another benefit is the chance to ask other subscribers for help in finding things such as heirloom seeds and plants. A real community magazine where readers can feel at home. Ideal for the backyard bird watcher. You'll find tips on identifying bird species, advice on feeding and gardening for birds. You'll also find articles by well known birders that will both entertain and inform you. Another bi-monthly publication that you'll read from cover to cover. Perfect for the intermediate birder. This one is for people who want to know more than identification and bird feeding. 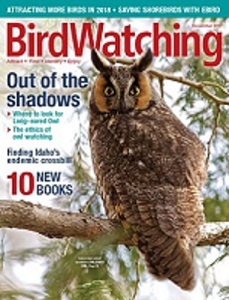 If you or someone you know enjoys bird watching, a subscription to any of these magazines will increase both your enjoyment and knowledge of our backyard birds.